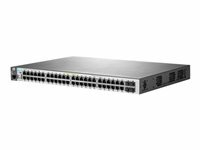 The Aruba 2530-8G-PoE+ Switch is an 8 port Gigabit fully managed L2 edge switch that delivers cost-effective, reliable, protected and easy-to-use connectivity to business networks. Designed for entry-level to midsize enterprise networks, these Gigabit switches deliver full L2 capabilities with enhanced access security, traffic prioritisation, and IPv6 host support. The HP 2530-8G-PoE+ Switches are IEEE 802.3af- and IEEE 802.3at-compliant with up to 30 W per port, making them suitable for voice, video, or wireless deployments with PoE+. The switch is easy to use, deploy, and manage via the SNMP, CLI, and Web GUI. It offers flexible wall, table, and rack mounting options; quiet operation with fan-less and variable-speed fan models; and improved power savings with features such as IEEE 802.3az energy-efficient Ethernet. And it includes Limited Lifetime Warranty 2.0 with 3 years 24x7 phone support and includes all software releases. It allows real-time traffic classification with support for eight priority levels mapped to either the queues, it uses weighted deficit round robin (WDRR) or strict priority (SP). It prioritizes traffic by specifying a port and priority level. VLAN-based prioritizes traffic by specifying a VLAN and priority level. It sets the IEEE 802.1p priority tag based on IP address, IP Type of Service (ToS), Layer 3 protocol, TCP/UDP port number, source port, and DiffServ. It sets per-port ingress enforced maximums for all ingressed traffic or for broadcast, multicast, or unknown destination traffic. It enables prioritisation based on TCP/UDP port numbers. It provides advanced configuration and diagnostics through a robust CLI. Simple Network Management Protocol (SNMPv1/v2c/v3) allows a switch to be managed with a variety of third-party network management applications. It automates device discovery protocol for easy mapping by network management applications. It allows the switch to be deployed and managed at the edge of an IPv6 network. Dual stack (IPv4/IPv6) supports connectivity for both protocols and provides a transition mechanism from IPv4 to IPv6. It forwards IPv6 multicast traffic to the appropriate interface; prevents IPv6 multicast traffic from flooding the network. It provides up to 15.4 W per port to IEEE 802.3af-compliant PoE-powered devices such as IP phones, wireless access points, and security cameras. It provides up to 30 W per port to IEEE 802.3 for PoE/PoE+ powered devices such as video IP phones, IEEE 802.11n wireless access points, and advanced pan/tilt/zoom security cameras. It adjusts automatically for straight-through or crossover cables on all ports. It provides access to many Layer 2 devices. It allows automatic learning and dynamic assignment of VLANs.